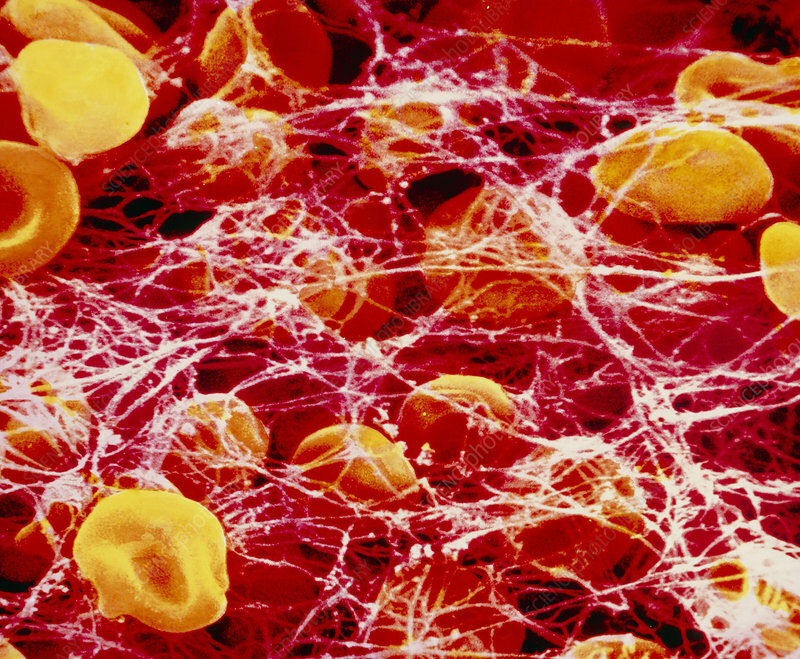 False-colour scanning electron micrograph (SEM) of a clot (thrombus) occurring in human blood, showing the netork of pink threads, composed of the insoluble substance fibrin. Fibrin formation during clotting is complex. The release of thromboplastin from an injured vessel & surround- ing platelets, in the presence of calcium ions, causes the conversion of prothrombin to thrombin. This results in the transformation of the blood protein fibrinogen into threads of fibrin which bind the clot. Also present are red blood cells (orange biconcave discs), which become deformed (crenated) in the concentrated plasma environment of the clot. Magnification: x1250 at 35mm size.